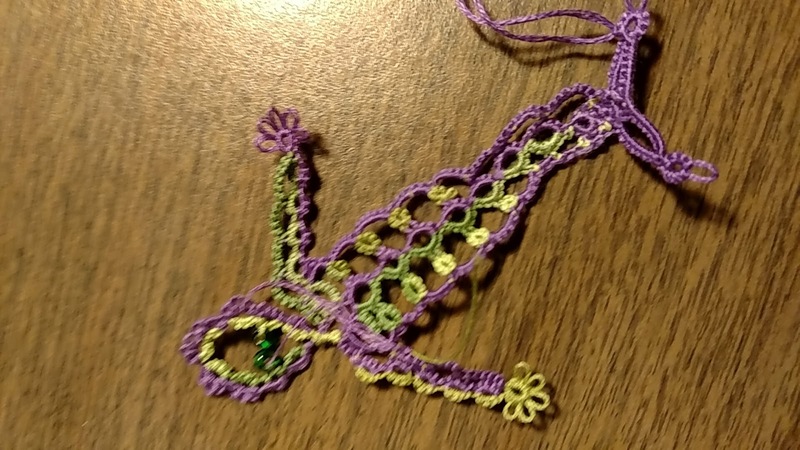 Tatting patterns with the added 'fun' factor. This blog is for the patterns which I'm going to list in 'parts' on my web site. These I'm calling the 'Tat It And See' (TIAS) as the finished result will not be seen until the pattern has been completed!!! 118. "Apparently she’s a very slow swimmer. 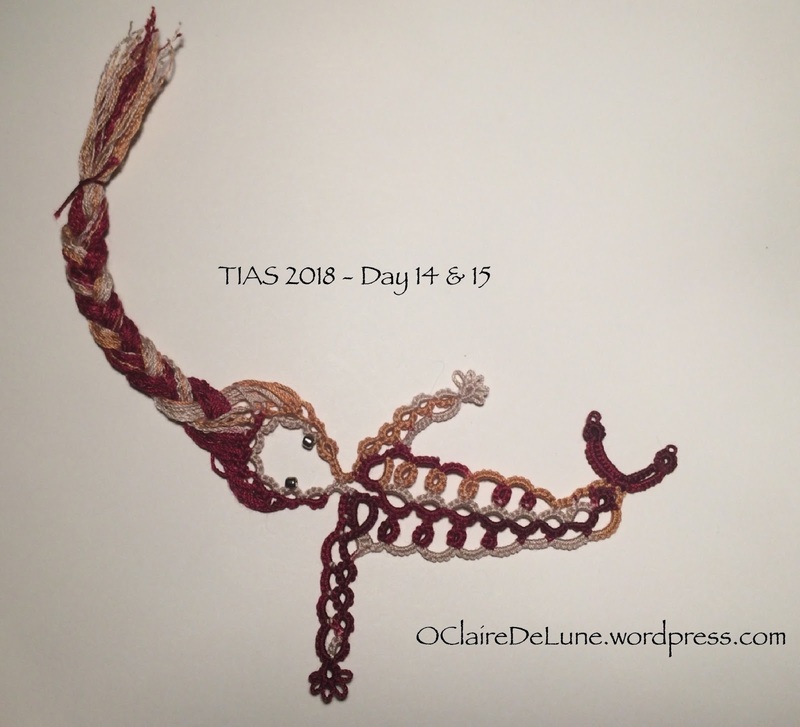 She was finished the week the last ‘instalment’ of the 2018 TIAS was released, but between needing to see the hairdresser, then swimming the width of that rather large pond to get to you, it took her a while. The mermaid is tatted with Lizbeth 20 (Girly Girl, I think was the color name). Hair is a thin metallic made by Superior Threads. 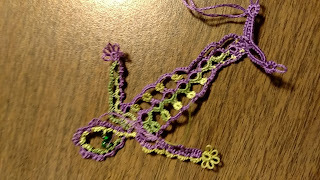 I used more than 1 strand of metallic per picot, since it is such a thin thread compared to size 20 Lizbeth cotton. 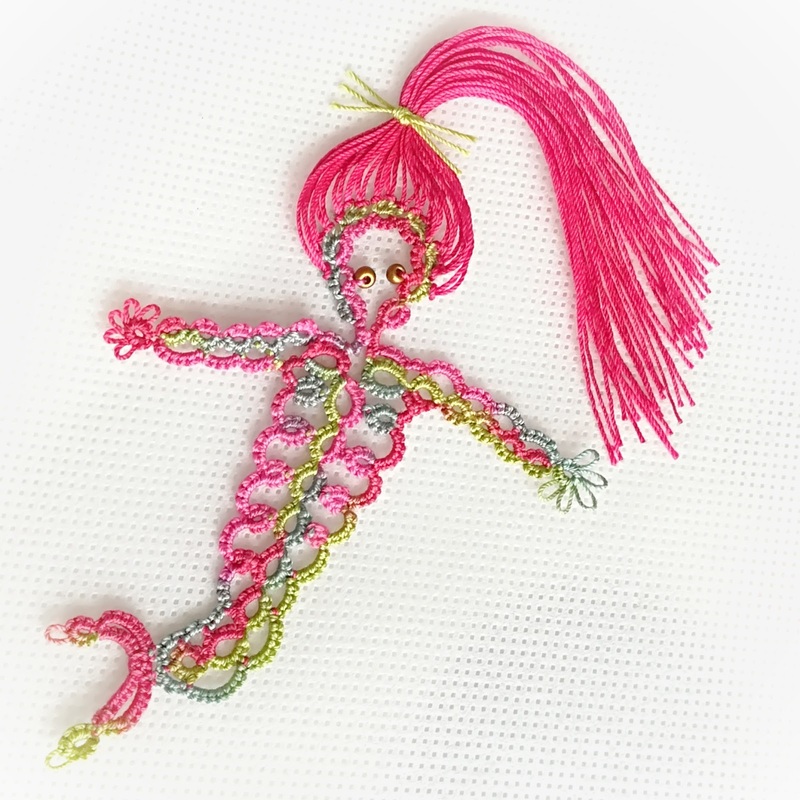 I'm very, very pleased to give you this link to Axa's blog post about her finished mermaid. This will be number 117 as you can see. This is the translation to her post. 117. "This year, I started a little late this challenge, but he is not left out. :) sample vessel made of lace technique Jane Eborall plans every year and makes up the steps of the sample blog just next instalment. Thanks for that, again this year. While together with us busy completed in several parts of the world, trying to figure out just what it is. Mostly he used to be a nice figure, and in most cases we can be sure it is the last step with what we started to prepare. Everyone can send the current portion of Jane, who places it on the blog so you can track where you are from, what they think, what will be the sample, and most of what people can just play with us." 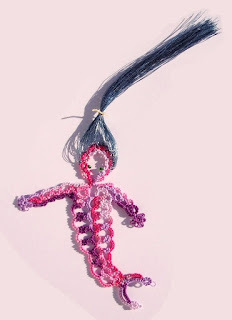 Well between us - Martha forgetting an attachment and me not noticing when she had we've finally got her mermaid into the TIAS blog!!! 115. "Oops, I kept forgetting about the mermaid." Next to arrive is Grace. Somehow I didn't get her earlier messages but thankfully she realised and has sent them in now. 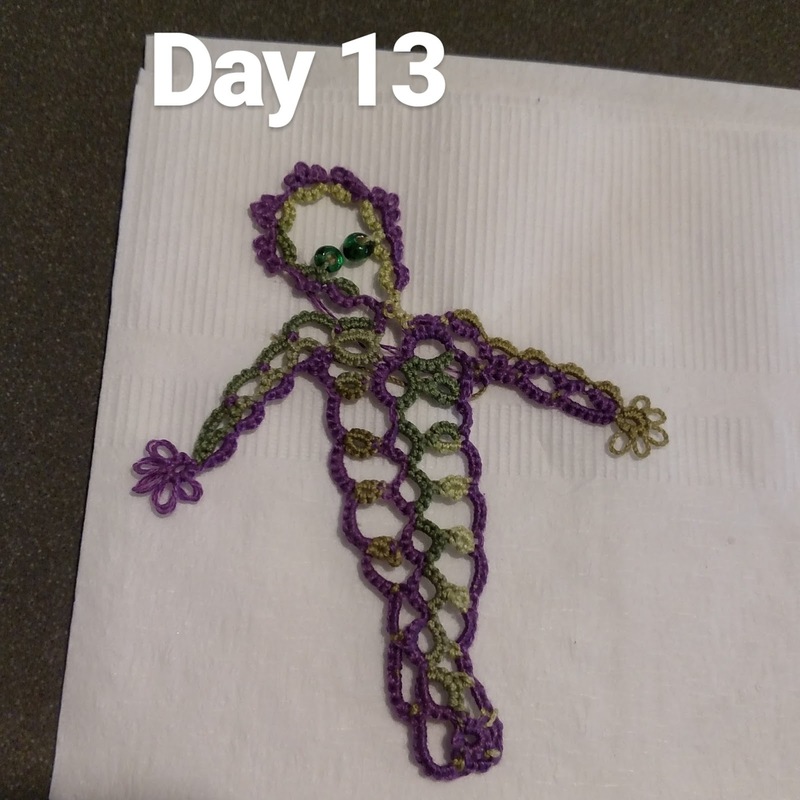 She's sent days 13, 14 and 15. I am sad to see the end of this TIAS, and I tried to make it last as long as possible but here is my finished mermaid. My mermaid was made using Lizbeth thread in size 20, in the colorway « Autumn Apple Pie » (#169). A big thank you to Jane for creating another great pattern, and sharing it as a fun game every year. 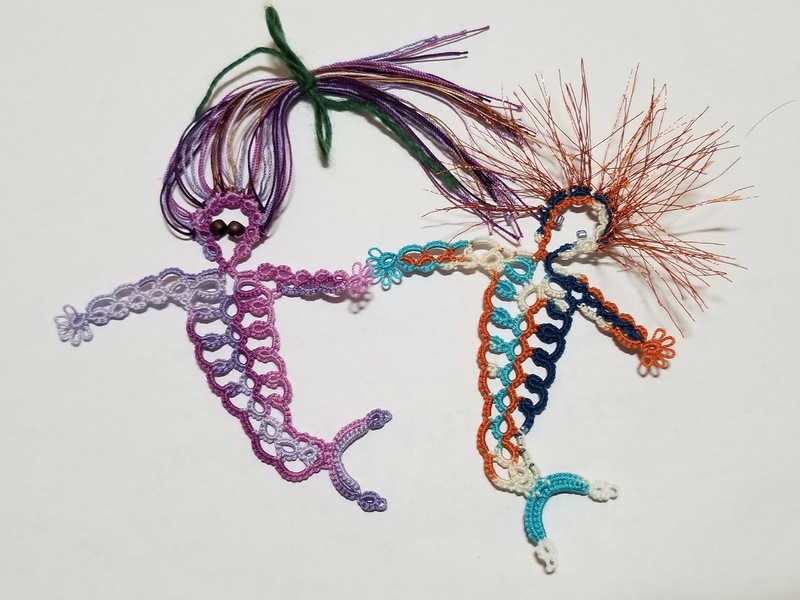 It was great to see tatters from all over the world participating to the game, and creating so many beautiful little mermaids. Happy International Tatting Day to all." 114. 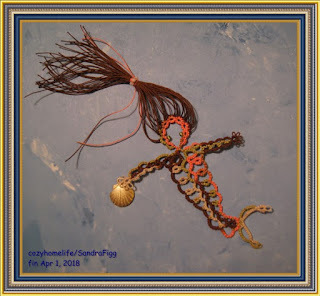 "Dear Jane, after many things hitting the fan here, I have finally been able to spend some time tatting and finish on April Fool’s Day (in the US, at least) – go figure! I’m so happy to have your precious mermaid, even though I thought for sure it might be a centipede, a pin the tail on the donkey game, or an ant eater, or a fox sawing logs –whew!! I do believe she is on her way to a party." 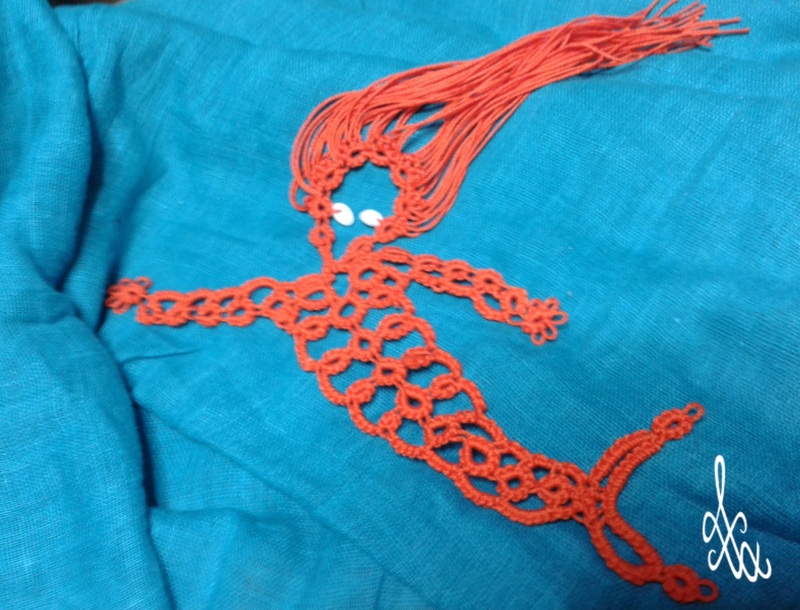 This mermaid was created by a group of friends. 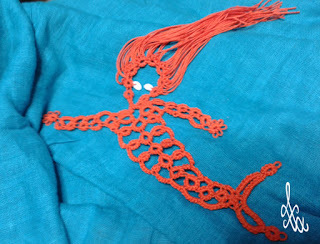 Thanks to Fran for the photo, Suzanne for mounting the mermaid on blue material and framing it, Barbara for the yellow perle cotton and especially to you for the T.I.A.S. pattern. I just did the tatting. 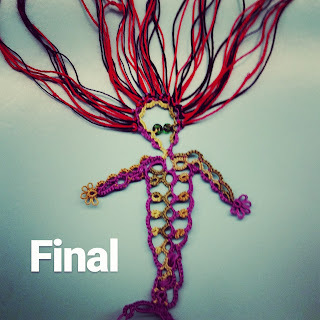 It was a wonderful project for our craft group. Another day, another mermaid or two or three!!! 112. "Well my mermaid took the long way to you as it has been swimming across the pond. Thanks for another wonderful TIAS this year. Perhaps BC3 will change its mind and do another next year. Phyllis in GA USA"
113. "This is my first TIAS a Merman. 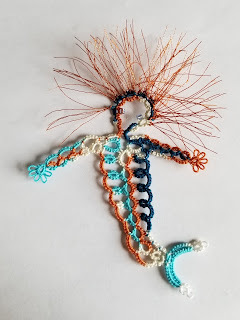 I think his name must be Herman the Merman since Google keeps autocorrecting my typing, LOL." "OMG, now it must be Herman the German Merman-- you must be SO confused! So many autocorrecting. Go home, Google, you're drunk!" Ummm, that's worrying a drunken google!!! 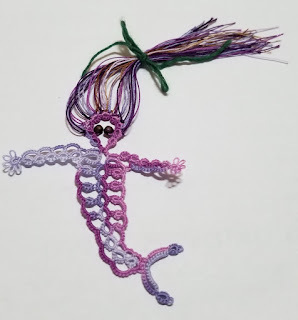 "My very purple mermaid #1 is finished. She has big, brown eyes and her name is Serena. She is friends with Herman. Serena is tatted with Lizbeth 20 #165 Grape Splash. 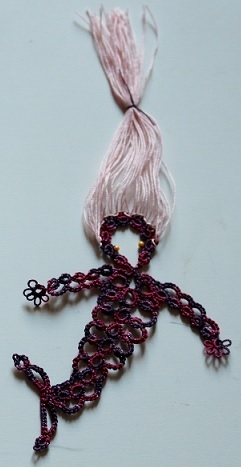 Strands of Elderberry Jam #177, Lilac Medium #642 and a variegated brown sewing thread make up her hair. 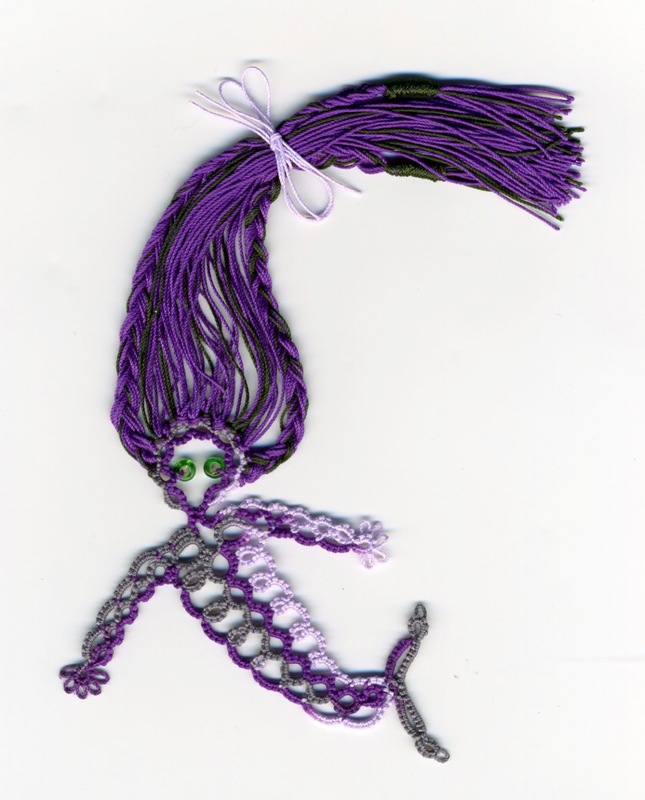 Karen/IsDihara from Woodbridge, VA, USA"
Today I'm happy to show you Alicja's mermaid. This one has had a long way to come - from Poland. This is the comment that came with it. 111. "Hello Jane,I know, it's late. Now I finished the mermaid. I'm late, but happy. Thank you for the fun! I used DMC Babylo thread. 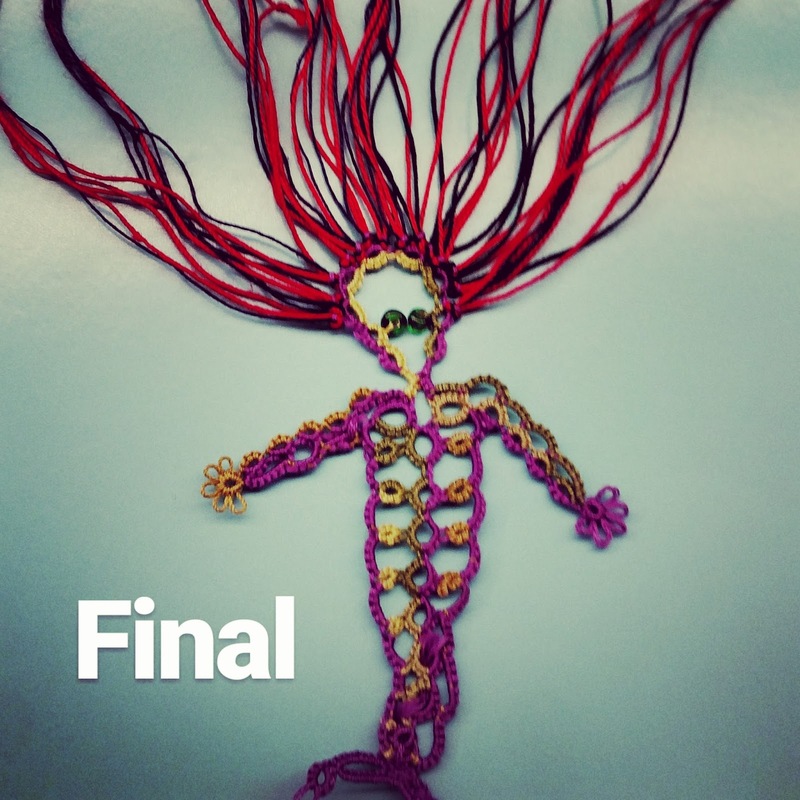 WOW, Alicja - those colours are amazing. Jane Eborall. Simple theme. Powered by Blogger.